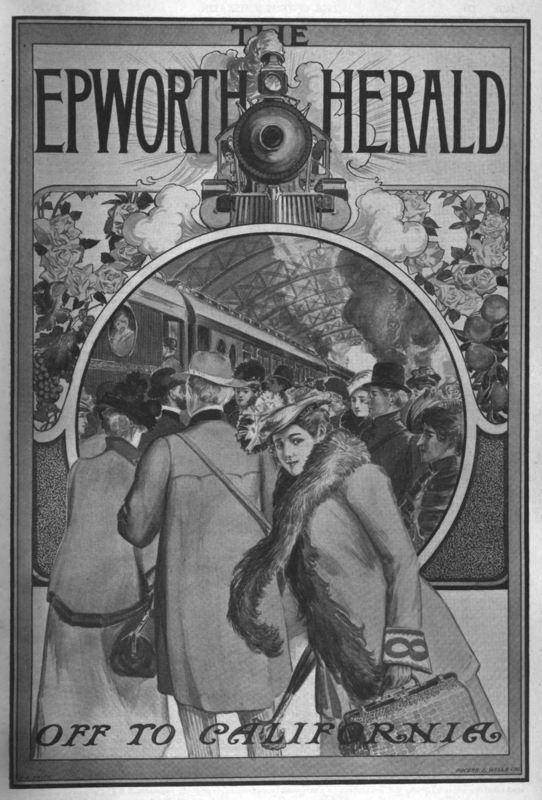 “Off to California” cover of The Epworth Herald vol. XI, no. 47 (April 20, 1901). 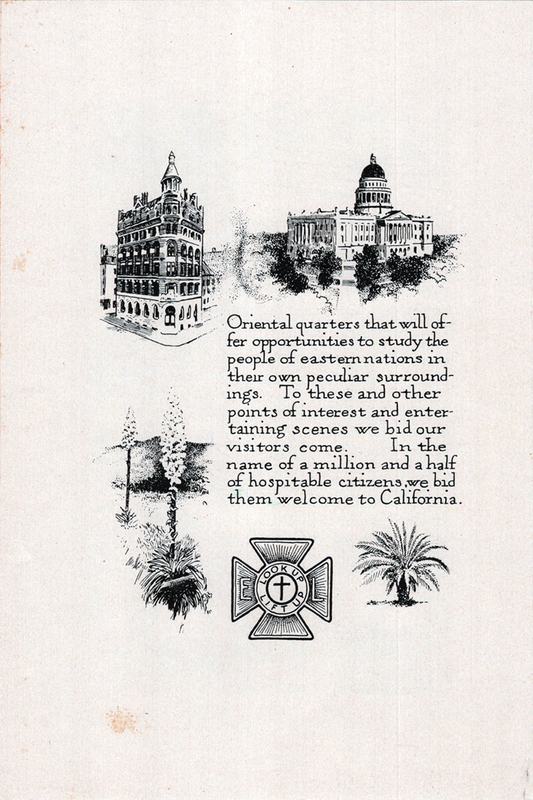 Design by Rogers & The issue contained several articles on the sights to be seen along the various railroad routes to California and in the Golden State itself, as well as suggested itineraries for touring the coast between San Francisco and Los Angeles. In this, the opening year of the new century, the eyes of the entire world are turned toward the Orient. California and her great metropolis, San Francisco, command the approaches to the far east. With fifty years of statehood, forming a glorious past, California occupies a commanding position, with possibilities seldom equaled and never surpassed by any other State in the Union. The first puzzle is whether the 6″ x 9″ item, titled Senate Concurrent Resolution No. 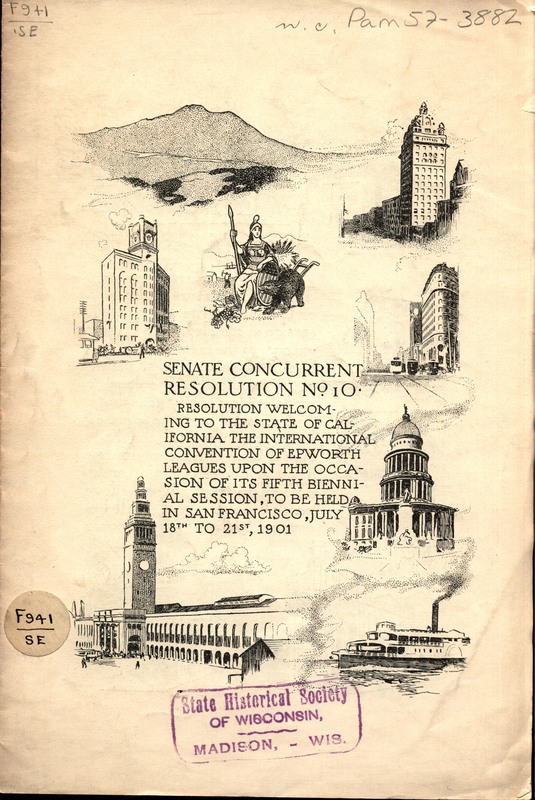 10; Resolution Welcoming to the State of California the International Convention of Epworth Leagues Upon the Occasion of Its Fifth Biennial Session, to Be Held in San Francisco, July 18th to 21st, 1901, is really a “pamphlet” as other copies of it are described. It consists of eight bound but unnumbered pages with no separate cover; there is no publication information, and there are no printing or design credits. The text, entirely hand-lettered in a monoline oldstyle roman, is surrounded on three sides (four for the title page) with small black-and-white pen-and-ink depictions of California scenes and people. In total there are 44 vignettes. It is printed on coated paper. The lack of publishing information suggests that the eight-page item might be a signature from some larger publication—possibly a special insert given the lack of pagination—or perhaps a leaflet intended for hand distribution. The presence of four copies of it in the 2001 Dwiggins Collection could mean that it is an offprint, which would support the theory that it was originally part of a larger publication. So far I have been unable to find any evidence to reach a definitive conclusion. 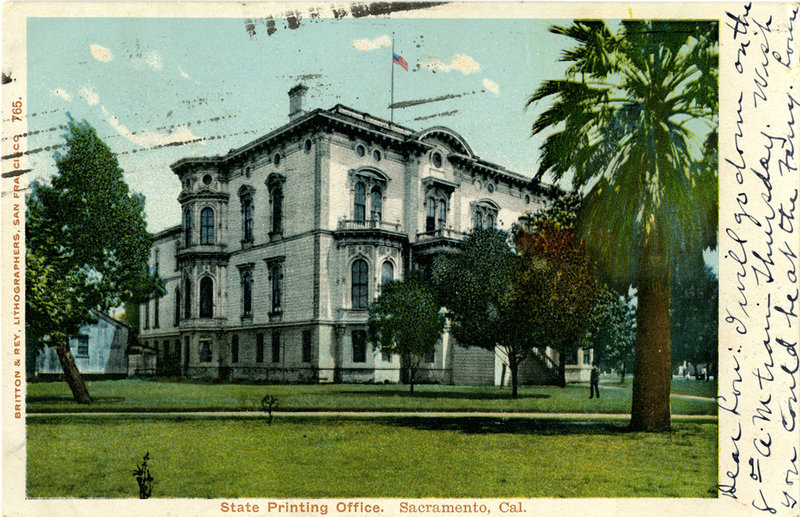 Postcard showing the Office of the State Printer in Sacramento, California (1890). Image courtesy of Special Collections of the Sacramento Publc Library. 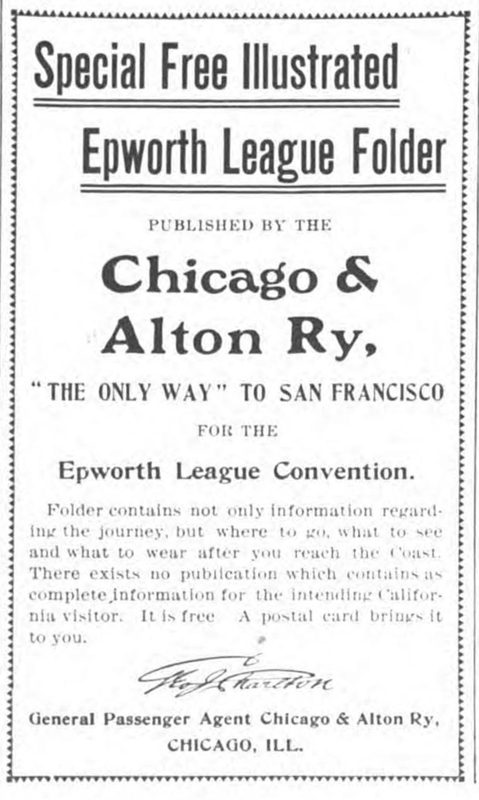 Chicago & Alton Railway advertisement in The Epworth Herald vol. XII, no. 2 (June 8, 1901), p. 41. The third puzzle concerns the 44 vignettes illustrating the Dwiggins item. None of them are captioned. Very few are immediately recognizable, but only four (at most) could be described as generic. Surprisingly, nearly all of them can not only be identified, but each of those can be linked to a specific photograph. 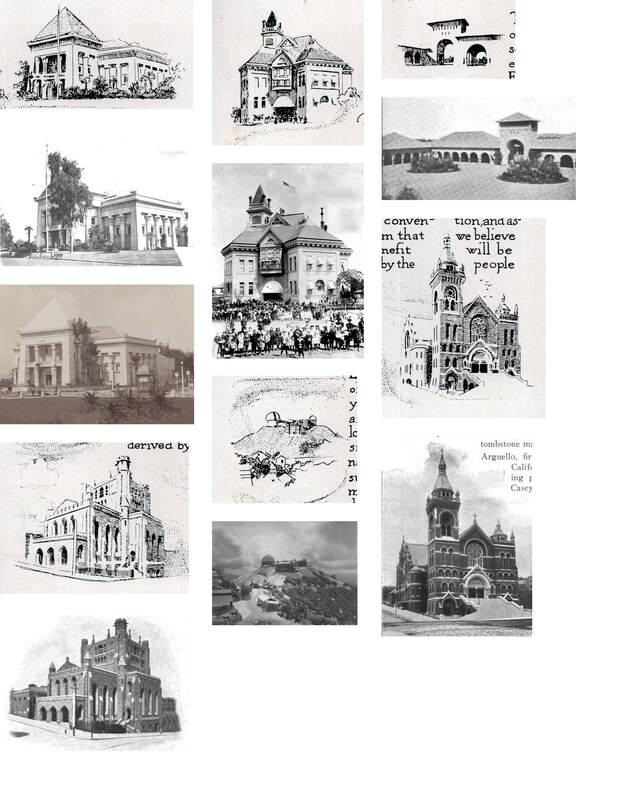 Here are each of the eight pages of the “pamphlet” with the great majority of the illustrations identified and their photographic models indicated. Senate Concurrent Resolution No. 10, p. . Design, illustrations, and lettering by W.A. Dwiggins (1901). Courtesy of the Wisconsin Historical Society. 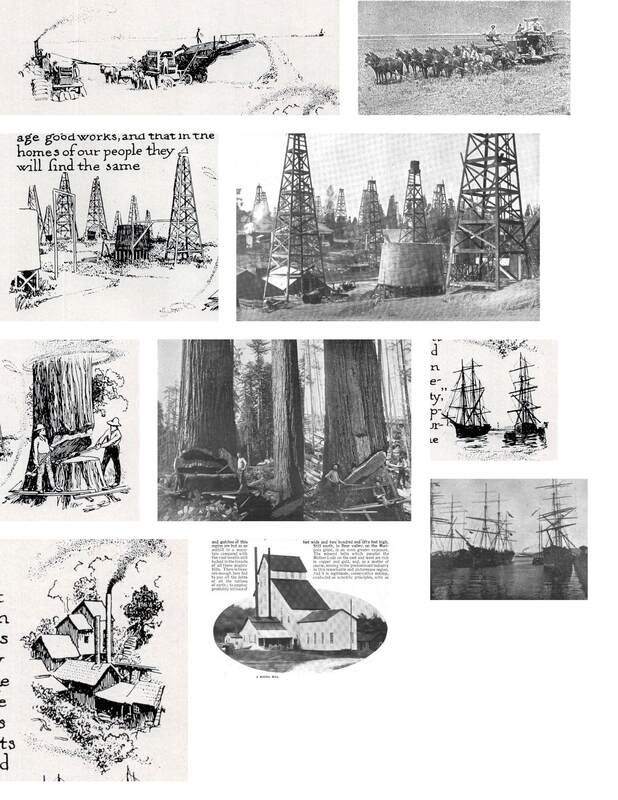 Attempt to match photographs to illustrations on cover p.  of Senate Concurrent Resolution No. 10. 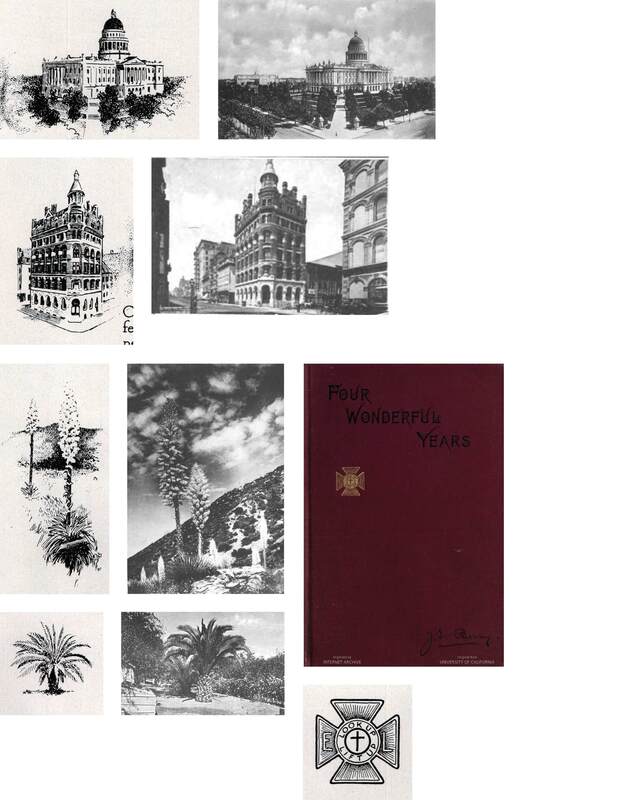 The photographs for the Crocker Building, San Francisco City Hall, and the Ferry Depot (now known as the Ferry Building) are exact matches to Dwiggins’ vignettes. Note the three cable cars abreast to the left of the Crocker Building. Senate Concurrent Resolution No. 10, p. . Design, illustrations and lettering by W.A. Dwiggins (1901). Image courtesy of Rare Books and Special Collections, Boston Public Library. Attempt to match photographs to illustrations on p.  of Senate Concurrent Resolution No. 10. The photographs for the K Street High High School, Lick Observatory, St. Mary’s Cathedral, and New Trinity Church are exact matches to Dwiggins’ vignettes. The photographs of the Gallery of Fine Arts have been flopped horizontally, something which Dwiggins may have done to improve the flow of the image in relation to the other images. Senate Concurrent Resolution No. 10, p. . Design, illustration, and lettering by W.A. Dwiggins (1901). Image courtesy of Rare Books and Special Collections, Boston Public Library. Only the photograph of the clipper ships is an exact match to Dwiggins’ vignettes. 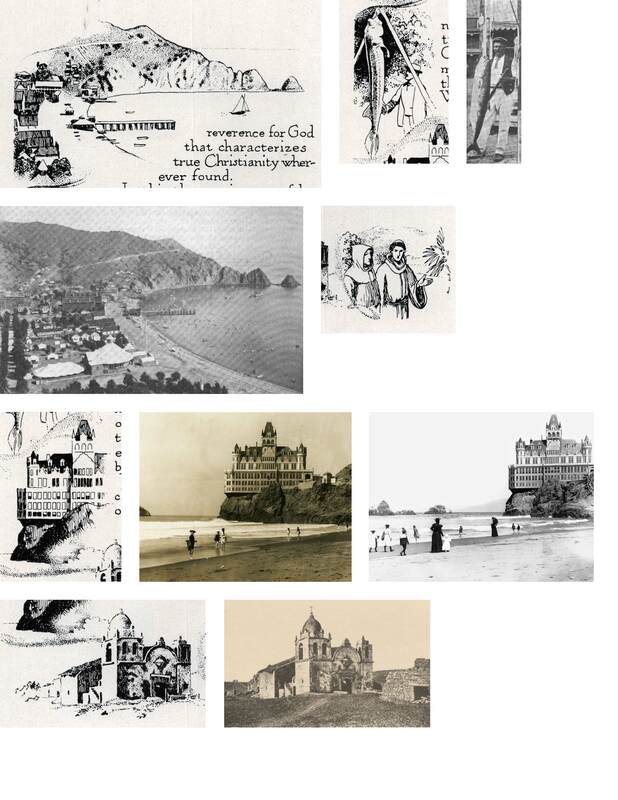 The photographs of the Bay at Avalon, the Mission of San Carlos Borroméo at Carmel, and the Cliff House are exact matches to Dwiggins’ vignettes, though there are at least two possibilities for the latter. The photograph for the Stimson mansion—identified only as “palatial residences in Los Angeles”—is an exact match to Dwiggins’ vignette. 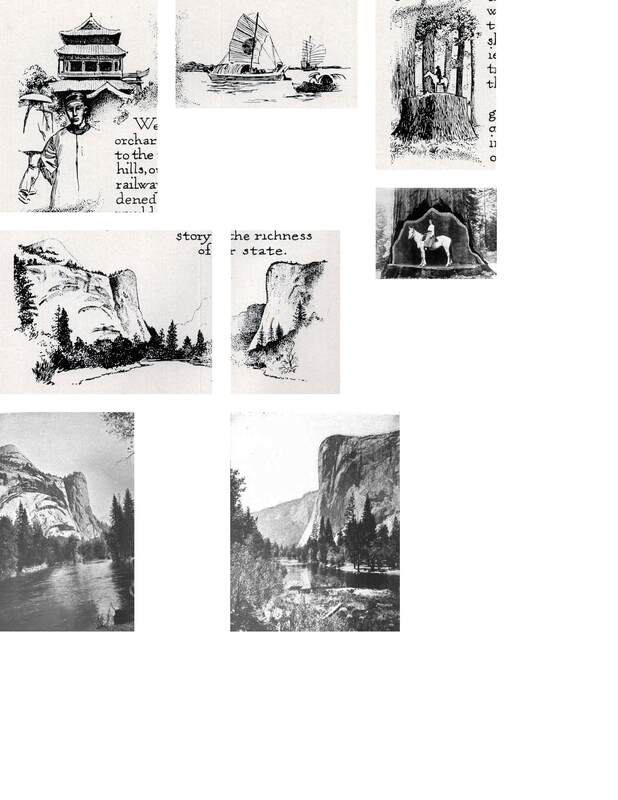 The photographs of El Capitan and North Dome at Yosemite Valley appear to be exact matches to Dwiggins’ vignettes. The photographs of drying fruit, grape picking in Fresno, the statue of Father Junipero Serra, and the Old Customshouse are exact matches to Dwiggins vignettes. Dwiggins’ vignettes exactly match the photographs of the State Capitol Building and the First National Bank Building. Twenty of the 44 vignettes that Dwiggins drew can be linked to specific photographs and it is very likely that nineteen of the remaining 24 are also closely derived from photographs. The only illustrations that may have been invented by Dwiggins without closely copying a reference source are the Great Seal of California, the pair of Franciscan missionaries, the Chinese men in front of a pagoda, the Chinese junks, and the fisherman with his catch. But Dwiggins did not copy the content in each photograph exactly. He often vignetted or cropped the images to strengthen the focus on the subject (e.g. cropping most of the town of Avalon out to focus on its bay on p. , discarding the left half of the photograph of workers picking grapes on. p.  to emphasize those in a single row, or ghosting the Call Building at the left of the Crocker Building illustration on p. 1]). He also deleted unnecessary elements (e.g. taking out some buildings in the background of the drying fruit on p. , and deleting the boat that is part of the Father Junipero Serra monument ) and, on occasion, added some features (e.g. adding the American flag to the flagpole of the Old Customhouse on p. ). Also note that Dwiggins linked the vignettes on a page with swirls of fine dots. 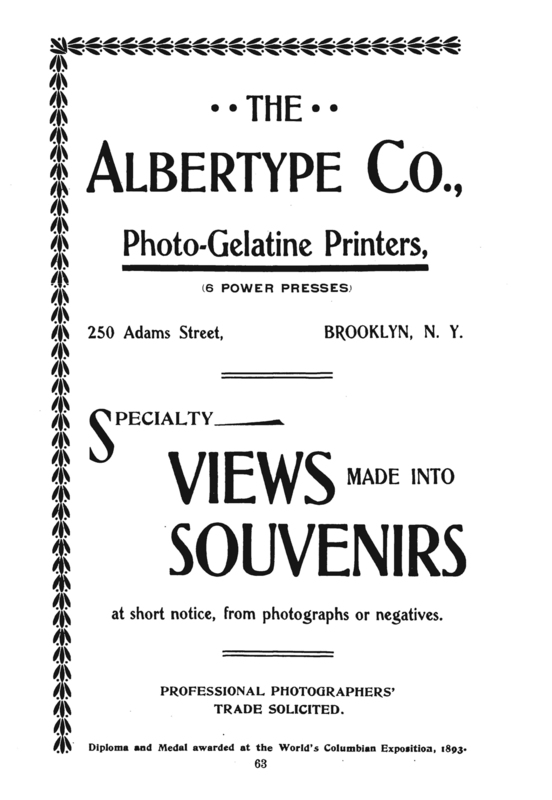 Albertype Co. advertisement in The American Annual of Photography and Photographic Almanac vol. 15 (1901), p. 63. An odd aspect of Senate Concurrent Resolution No. 10 is the selection of sights and activities that Dwiggins illustrated. Not only are Mt. Shasta, San Diego, and the University of California at Berkeley (“our great State university”) missing, all of which the original resolution specifically mentioned, but numerous other popular tourist attractions of the day are absent. Among them are ostrich farms, the Hotel Del Monte, the incredibly ornate Hotel del Coronado, Bridal Veil Falls at Yosemite, Lake Tahoe, the more popular Spanish missions (e.g. San Juan Capistrano and Santa Barbara), the Mark Hopkins Institute of Art, cable cars, Golden Gate Park, the Los Angeles County courthouse, and the Mt. Lowe railway. Furthermore, some of the things that Dwiggins sketched were not relevant (e.g. Chinese junks) or of minor importance (e.g. the First National Bank, the K Street High School in Fresno, or Anna Greenwood). Either his client directed the choice of things to illustrate or Dwiggins was constrained by the reference material available to him. Early work by W.A. Dwiggins shown in The Inland Printer vol. XXVII, no. 4 (July 1901), p. 596. It is curious that The Inland Printer did not reproduce a page from the Epworth League item (or even mention it) since it exemplified their claim that Dwiggins created “work thoroughly in harmony with the printed page”. Perhaps the item was still in production when the magazine went to press. If so, then it would have been one of Dwiggins’ first professional jobs. But there is also the slim possibility that it was a student assignment. It certainly would have fit into Holme’s teaching. Furthermore, the school had the facilities to print an 8-page signature. If the Epworth League item was a school project that would explain the lack of credits and the absence of a cover or true title page; the use of hand-lettering instead of type for the text; the somewhat odd choice of images—and the fact that it involved a tremendous amount of work for such a seemingly small job. Finally, Holme—with his numerous newspaper connections in San Francisco as well as Chicago—may have been able to secure the photographs that provided Dwiggins with his base material. Senate Concurrent Resolution No. 10 remains an enigma. 1. See The Story of the Epworth League by Paul Hutchinson (New York and Cincinnati: The Methodist Book Concern, 1927). 2. The Epworth League had an estimated 2.5 million members and 6893 junior chapters in 1899. See the San Francisco Chronicle 30 December 1900, p. 45. 4. San Francisco Call 12 April 1901, p. 6. 5. See the San Francisco Chronicle 30 December 1900, p. 45 for the initial plans for the “California products” exposition and the San Francisco Call 11 July 1901, p. 7 for a partial description of the final display. The hopes for increased tourism were not unwarranted. See “Model Itineraries” in the “Off to California” issue of The Epworth Herald vol. XI, no. 47 (April 20, 1901), p. 1163 which sets forth possible sites to see from San Francisco to Los Angeles such as Cliff House and Santa Catalina Island. 6. San Francisco Call 4 January 1901, p. 9. It took several months for the railroads, via the Transcontinental Passenger Association, to come to an agreement about special convention rates that they would all abide by. Some railroads had offered free tickets to officers of the Epworth League in the hopes that they could secure their patronage. See issues of the San Francisco Chronicle and the San Francisco Call during the period January to May, 1901 for details of the negotiations. the fnal rates ranged from $35 to $50 depending on the point of origination east of the Rocky Mountains. The principal railroads that were angling for the traffic engendered by the Epworth League convention were the Southern Pacific Company, the Atchison, Topeka and Santa Fe Railway, the Great Northern Railway, and the Chicago, Burlington and Quincy Railroad. 7. Senate Concurrent Resolution No. 10 [March 16, 1901] in The Journal of the Assembly During the Thirty-Fourth Session of the Legislature of the State of California, 1901 (Sacramento: A.J. 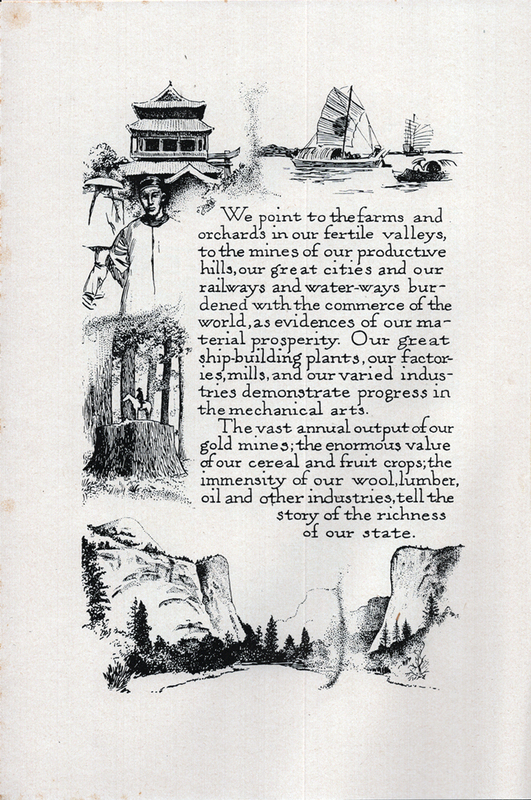 Johnston, Superintendent State Printing, 1901), pp. 1273–1274. The text was also reprinted—with several textual changes along with different capitalization and punctuation—in The Epworth Herald vol. XI, no. 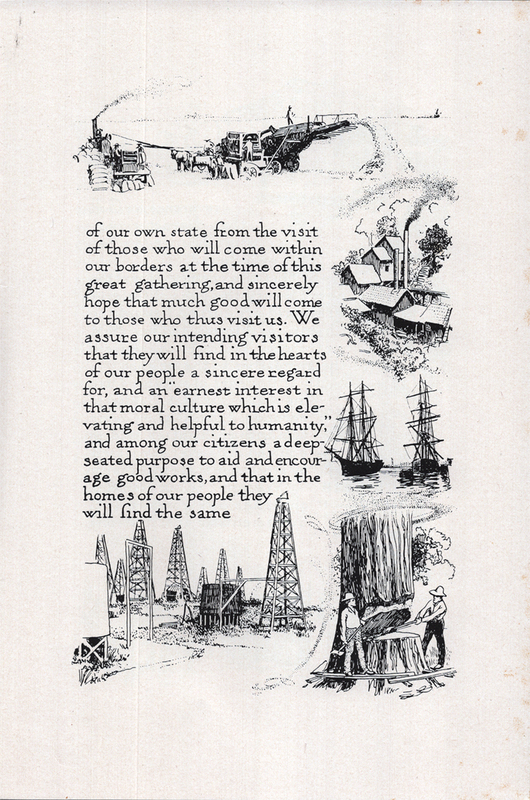 47 (April 20, 1901) “Off to California” issue, p. 1164. 8. See Boston Public Library, Rare Books and Special Collections, W.A. Dwiggins 2001 Collection, Box 6, Folder 3. For the provenance of the Boston Public Library copies see Theodore Bozarth to Dorothy Abbe 21 April 1966 and 28 April 1966 in Boston Public Library, Rare Books and Special Collections, Abbe 2001 Collection, Box 22, Folders 1079 and 1082. How Bozarth (1918–2005), a retired lieutenant colonel in the Air Force, living in Titusville, New Jersey, came to know Eleanore Hoyle (1900–1969), a teacher of Latin at the George School in Newtown, Pennsylvania, is unclear. He was apparently a philatelist and a Dwiggins collector. 9. There are four copies of the “pamphlet” in the 2001 Dwiggins Collection. Two other copies are known to exist, one at the University of California at Berkeley, Bancroft Library and one at the Wisconsin Historical Society, both of which are bound with other pamphlets about California. All are identical. 10. Senate Concurrent Resolution No. 11 [March 16, 1901] in The Journal of the Assembly During the Thirty-Fourth Session of the Legislature of the State of California, 1901 (Sacramento: A.J. Johnston, Superintendent State Printing, 1901), p. 1274. The Resolution stipulated that 30,000 copies be printed (with 500 set aside for members of the California State Legislature and officers of the State) at a cost of no more than $750. 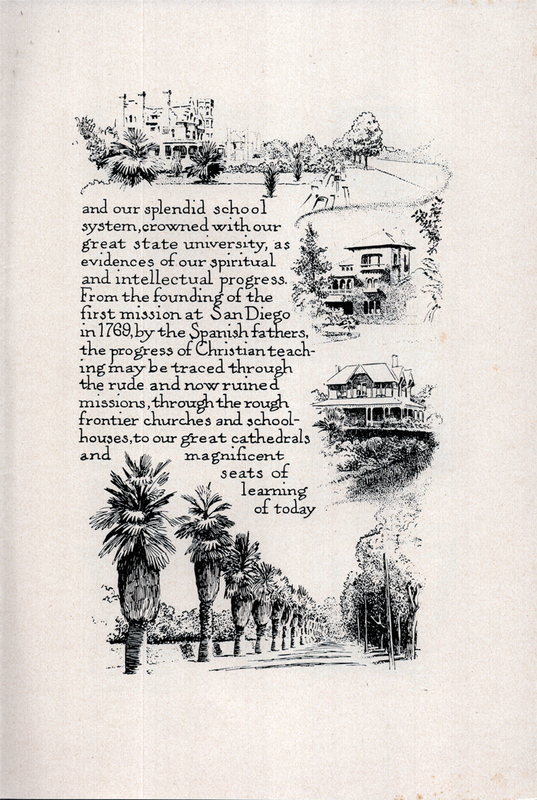 A similar Resolution, with similar printing specifications, was passed by the California State Legislature in 1897 when the Christian Endeavor Societies convention was held in San Francisco. See The Statutes of California and Amendments to the Codes, Passed at the Thirty-Second Session of the Legislature, 1897 (Sacramento: A.J. Johnston, Superintendent State Printing, 1901), p. 637. W.A. Dwiggins: A Life in Design by Bruce Kennett (San Francisco: Letterform Archive, 2018), p. 24 reproduces pp. 2–3 of Dwiggins’ “pamphlet”. 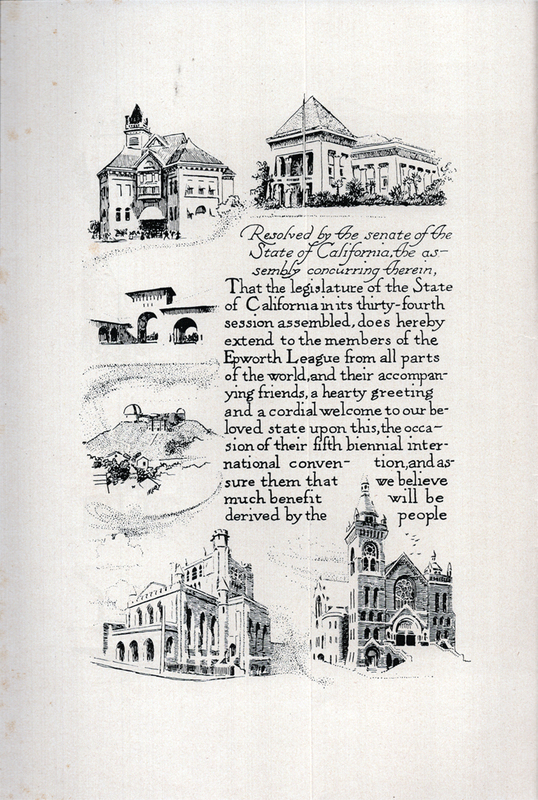 In the caption Kennett credits the California Legislature as Dwiggins’ client, but he makes no mention of it in his text. 11. Johnston would have been especially mindful of the cost of printing anything as an exhaustive investigation by the Legislature into the Office of the State Printer led by Frank Leavitt, Chas. M. Shortridge, and R.P. Ashe had just delivered its report on January 14, 1901. Although the report was very favorable to Johnston and his office, its emphasis on cost savings (e.g. using the linotype machine to either replace or augment the compositors) would have been fresh in his mind. See “Report of Committee on Investigation of the State Printing Office” in The Journal of the Assembly During the Thirty-Fourth Session of the Legislature of the State of California, 1901 (Sacramento: A.J. Johnston, Superintendent State Printing, 1901), pp. 82–108. 12. Hadley moved from Los Angeles to Sacramento in 1892 or 1893 where he became the bookkeeper for the State Printing Office. In 1898 he was promoted to Deputy Superintendent, a position he held until his move to San Francisco in 1903. For his whereabouts see Directory for Sacramento City and County for 1893… (San Francisco: F.M. Husted, Publisher, 1893), Directory for Sacramento City and County for 1893… (San Francisco: F.M. Husted, Publisher, 1898), and Sacramento City and County Directory 1903… (Sacramento: H.S. Crocker Co., Publishers, 1903). 13. Dwiggins’ text ignores the six “whereas” paragraphs about the 5th biennial international convention of the Epworth League and begins with the “resolved” paragraph. It thus focuses entirely on the wonders of the State of California. There are a few variations in capitalization and hyphenation from the original, but it is a more accurate version of the resolution than the one published in The Epworth Herald (see note 7 above). 14. For example see Facts about Fresno County, California’s Marvel (Fresno: Franklin Printing House, 1900? ), Fresno County California by Chamber of Commerce (Fresno: Evening Democrat Print, 1901) The Sacramento Valley as a Field for Profitable Development by the Sacramento Valley Development Association (Sacramento: A.N. Bullock, Printer, c.1901), or San Francisco by Atchison, Topeka & Santa Fe Railway Co., (Chicago: Atchison, Topeka & Santa Fe Railway Co., 1901). The only publications with Senate Concurrent Resolution No. 10 in their title found in OCLC are the copies of the Dwiggins item at the Bancroft Library, University of California at Berkeley and the Wisconsin Historical Society. Whatever happened to the publication requested by Senate Concurrent Resolution No. 11? 15. The advertisement appeared in The Epworth Herald vol. XII, no. 2 (June 8, 1901), p. 41. I have been unable to find a copy of the Chicago & Alton Railway publication. Since the Chicago & Alton Railway’s tracks did not extend beyond Kansas city it must have partnered with another railroad to complete the journey to San Francisco. Other railroads operating out of Chicago or with agents located there offered special folders or maps to Epworth convention-goers. See the multiple advertisements by W.G. Niemyer, General Western Agent, Southern Pacific Co., 238 Clark Street, Chicago in The Intelligence (e.g. May 15, 1901, p. 400 and June 15, 1901, p. 488); and those by Charles S. Fee, General Purchasing Agent in St. Paul, Minnesota, for the Northern Pacific Railroad in The Intelligence (e.g. May 15, 1901, p. 400). 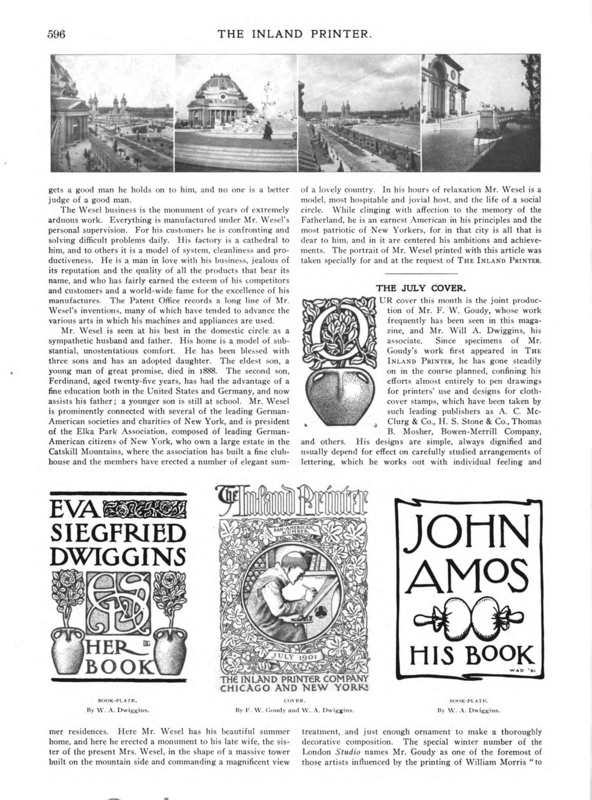 Fee promoted an Epworth folder and “a finely illustrated tourist book, Wonderland 1901”. However, the latter only had information about tourist sites along the railroad’s route and nothing about California. The Southern Pacific produced a Map of the city of San Francisco, showing points of special interest to attendants upon the International convention of the Epworth League, San Francisco, Cal., July 18 to 21, 1901, with side trip rates and itineraries to points of interest in California by the Southern Pacific Company. On one side it had “numbered locations of places of Methodist interest and historical” while the verso had “23 panels detailing trips excursions to Yosemite Valley, Southern California including Pasadena, Redlands, Riverside, Palo Alto, Santa Cruz, Lick Observatory.” The latter list matches a number of Dwiggins’ vignettes, but the Southern Pacific map is unillustrated. 16. The Epworth Herald was published by the Methodist Church in Chicago at 83 Washington Street. It was printed by Jennings & Pye. Gaspard, who taught pen-and-ink illustration at The School of Illustration, lettered and illustrated the heading for “Among Red-Iron Workers” by Eugenia D. Bingham, a serial that appeared in The Epworth Herald issues for July 6, 13 and 20, 1901. 17. Souvenir, song book and official program. 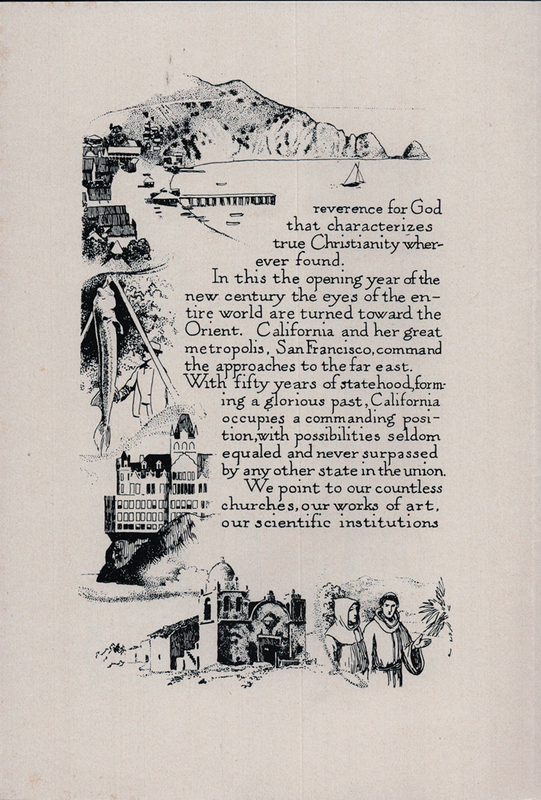 Fifth International Convention of the Epworth League held in San Francisco … 1901. (San Francisco: Sunset Press, 1901). 18. 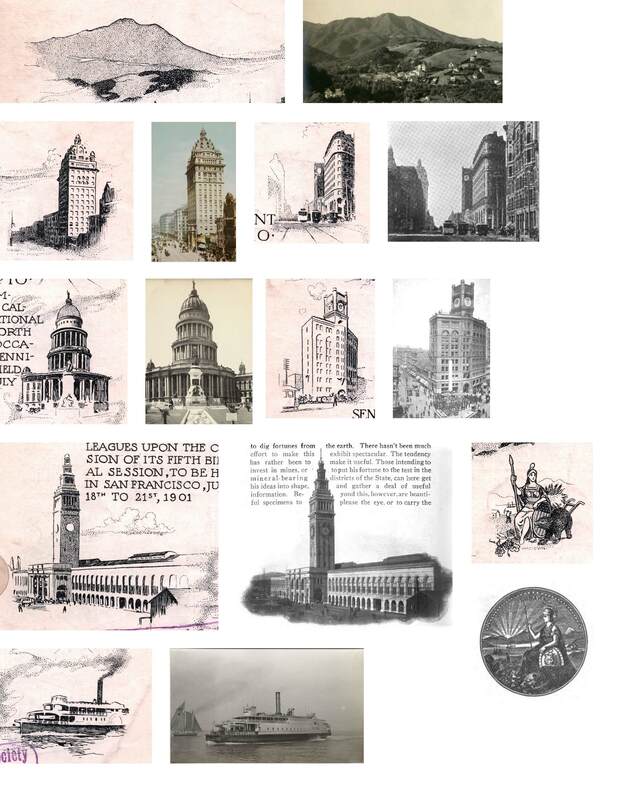 The Call Building photograph is from a 1900 postcard from the Detroit Photographic Co.; the Crocker Building photograph appears in several sources, the earliest being San Francisco: Photo-Gravures from Recent Negatives by the Albertype Company (San Francisco: Jos. A. Hofmann, 1892); there are several sources for the photograph of San Francisco City Hall, one of them being Sunset vol. III, no. 3 (July 1899), p. 90; and the Ferry Depot photograph is from San Francisco by the Passenger Department of the Santa Fe Route (Chicago: Atchison, Topeka, and Santa Fe Railway Co., 1901), p. 20. The Great Seal of California “…shows the Roman goddess Minerva (Athena in Greek mythology), the goddess of wisdom and war, because she was born an adult, and California was never a territory; a California grizzly bear (the official state animal) feeding on grape vines, representing California’s wine production; a sheaf of grain, representing agriculture; a miner, representing the California Gold Rush and the mining industry; and sailing ships, representing the state’s economic power. The word Eureka (εύρηκα in Greek), meaning ‘I have found it’, is the California state motto.” from “Great Seal of California” Wikiwand Dwiggins has assembled these elements in a clearer manner. Most notably he has turned Minerva so she faces the viewer. 19. The photograph of the K Street High School is from 1897 before the school changed its name. It can be found as “A Fresno school” in Sunset vol. IV, no. 1 (November 1899), p. 10. New Trinity Church and St. Mary’s Cathedral both appear in several publications including San Francisco by Atchison, Topeka & Santa Fe Railway Co. (1901), pp. 36 and 87 respectively. The Lick Observatory photograph is also very common, appearing in Sunset vol. IV, no. 2 (December 1899), p. 47, and The Epworth Herald vol. XI, no. 47 (April 20, 1901), p. 1151 as well as A Picture Journey over Sunset Route: Being a Series of Reproductions of Seventy-Four Photographs of the Principal Spots of Scenic, Romantic and Historic Interest between New York City – New Orleans – San Antonio – El Paso – Phoenix – San Diego – Los Angeles – San Francisco by the Passenger Department of the Southern Pacific Company (San Francisco: Southern Pacific Company, 1900). The view of one of the gateways to the Main Quadrangle at Stanford University is in A Picture Journey over Sunset Route as well as Sunset vol. III, no. 1 (May 1899), p. 65, The Rand-McNally Guide to California via “The Overland Route” by A. Darlow and Harry Brook (Chicago and New York: Rand, McNally & Company, Publishers, 1900), and The Epworth Herald vol. XI, no. 47 (April 20, 1901), p. 1151. 20. The photograph of the masted ships is from Sunset vol. III, no. 1 (May 1899), p. 62. California: Brief Glimpses of Her Valleys, Mountains, Lakes & Famous Places by James W. Steele (Chicago: Passenger Department, The Burlington Route, 1900), p. 27. This specific photograph of Mission San Carlos Borroméo in Carmel is somewhat common. See Sunset vol. III, no. 1 (May 1899), p. 66, Sunset vol. IV, no. 1 (November 1899), p. 11, and El Camino Real: The Highway Connecting the Twenty-One Missions from North to South by D.A. Hufford (Los Angeles: D.A. Hufford & Co., Publishers, 1901). 22. The photograph of the Stimson mansion is from John L. Stoddard’s Lectures (Boston: Balch Brothers, 1898) vol. 10, p. 23 where it is labeled “Palatial residences in Los Angeles”; that of the Stuart residence is from Sunset vol. IV, no. 2 (December 1899), p. 53; the decorated version of the photograph of Magnolia Avenue in Riverside is from Sunset vol. VIII, no. 3 (January 1902), p. 113. 23. The photograph of Anna Greenwood astride a white horse atop a giant sequoia tree stump was found online without any attribution. 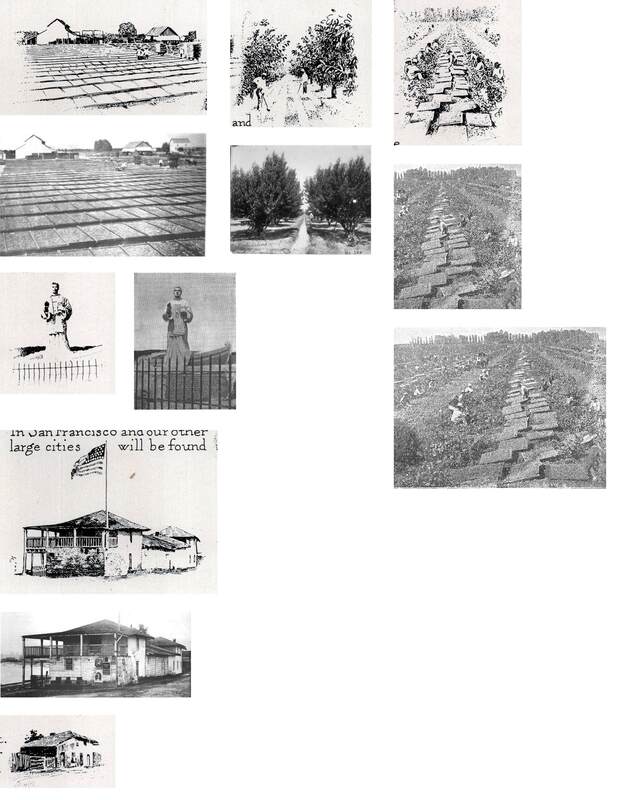 However, a photograph from the same session is shown inFacts about Fresno County: California’s Marvel (Fresno, California: Fresno County Chamber of Commerce, 1900), p. 24. Both of the photographs of North Dome and El Capitan come from Yosemite Souvenir and Guide by D.J. Foley (Yosemite National Park, California: “Tourist” Studio Office, 1901), pp. 38 and 48. 24. “At the Dryer” is from Sunset vol. IV, no. 1 (November 1899), p. 12 and “Picking Season in a Fresno Vineyard” is from Facts about Fresno County: California’s Marvel (Fresno, California: Fresno County Chamber of Commerce, 1900), p. 5. The photograph of the fenced-in statue of Father Junipero Serra can be found in The Christian Advocate vol. LXXV, no. 38 (September 20, 1900), p. 1525 and the photograph of the Old Customshouse at Monterey is taken from Memorial and Biographical History of the Coast Counties of Central California edited by Henry D. Barrows and Luther A. Ingersoll (Chicago: The Lewis Publishing Company, 1899), p. 50. The latter also appears in The Rand-McNally Guide to California via “The Overland Route” by A. Darlow and Harry Brook (Chicago and New York: Rand, McNally & Company, Publishers, 1900), p. 4. 25. The photograph of the State Capitol of California at Sacramento can be found in many sources, Here it comes from The Rand-McNally Guide to California via “The Overland Route” by A. Darlow and Harry Brook (Chicago and New York: Rand, McNally & Company, Publishers, 1900), p. 3. The photograph of the pre-earthquake First National Bank can be found on the Sierra Club website https://www.sierraclub.org/library/sierra-club-offices. 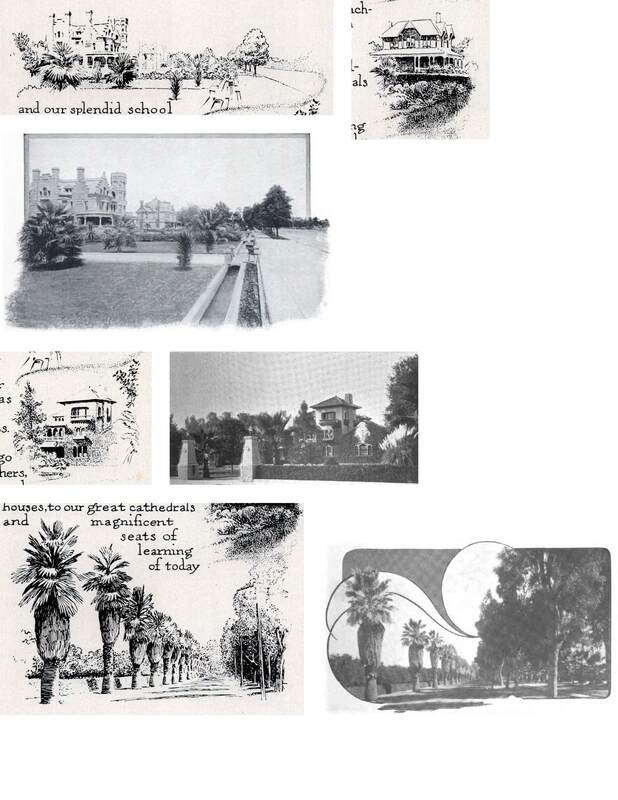 The photograph of the date palm tree is from Souvenir of San Jose, and Vicinity.”The Garden City” (San Francisco: Crockwell & Williams, 1894). The sample of the Epworth League badge is from the cover of Four Wonderful Years: A Sketch of the Origins, Growth, and Working Plans of the Epworth League by Joseph F. Berry (New York: Hunt & Eaton, 1893). 26. The Albertype Co., located in Brooklyn, was founded in 1890 by Adolph and Herman L. Wittemann as a postcard and viewbook (souvenir album) publisher. They hired teams of photographers to document states, cities, universities and natural aspects of the United States. 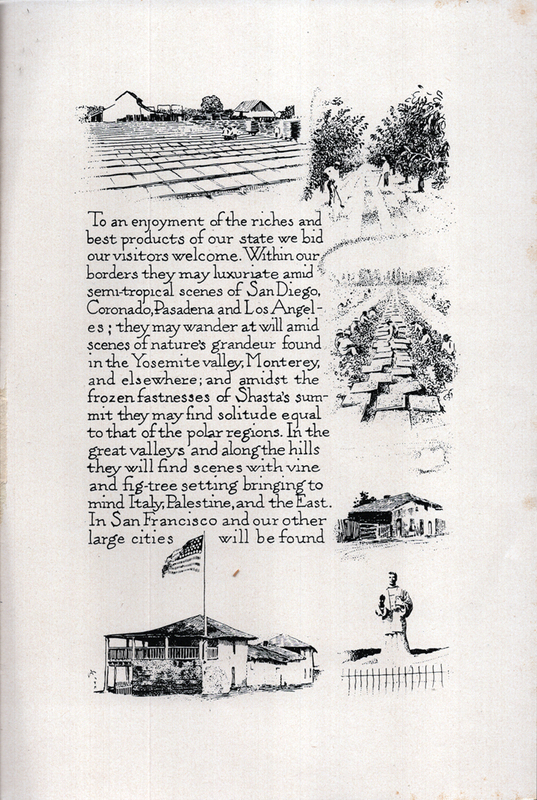 Among the viewbooks they made were many for California: Mt. Shasta, Sacramento, San Francisco, the Cliff House, Oakland, Stanford University, San Jose, Lick Observatory, Monterey, Santa Cruz “Big Trees”, the Old Missions of California, the Coast Line Route, Chico, Stockton, Watsonville, Salinas, Marysville and Yuba City, Santa Barbara, Los Angeles, Pacific Grove, Ventura, Riverside, Del Monte, and San Diego. Their photographs were reproduced using albertypes (an improved version of the collotype invented by Joseph Albert in Austria in the late 1860s). The company closed in 1952. 27. See Wilson’s Photographic Magazine vol. XXXIII, no. 469 (January 1896), p. 47; the business directory section of The Inland Printer vol. XXIV, no. 3 (December 1899), p. 497; and The American Annual of Photography and Photographic Almanac vol. 15 (1901), p. 63. 28. Catalogue “F”: Scenic, Architectural and Marine Views (Detroit: Detroit Photographic Company, 1899) lists prints of Lick Observatory, San Carlos Borromeo mission, Orange Grove Avenue in Pasadena [probably the Stuart residence], Magnolia Avenue in Riverside, The Cliff House, Avalon from the South, El Capitan, Domes and Washington Column in Yosemite Valley, “Residence on Figueroa Street” in Los Angeles [probably the Stimson mansion], The Old Custom House, Serra’s Monument, Mt. Tamalpais, several sides of the Main Quadrangle at Stanford University, Ferry Boat “Oakland”, “Vessels in the Bay,” and date palms. A number of the company’s California photographic postcards are viewable online at the New York Public Library Digital Collections and at the Library of Congress. 29. The Lakeside Annual Business Directory of the City of Chicago 1896 (Chicago: The Chicago Directory Co., 1896), p. 1432. Also see The Lakeside Annual Business Directory of the City of Chicago 1900 (Chicago: The Chicago Directory Co., 1900), p. 2378. California, 1898 by Mayo & Weed, Chicago ([Chicago]: Mayo & Weed, 1898) consists of 111 mounted photographs of scenes from California, Colorado, and Utah. 30. See The Asheville Citizen-Times 27 February 1901, p. 4 which said that Holme had arrived the day before; also The Asheville Daily Gazette 28 February 1901, p. 8. The School of Illustration lingered on until at least the winter of 1904, months after Holme succumbed to tuberculosis. 31. The Inland Printer vol. XXVII, no. 4, pp. 596–597 discuss the work of both Goudy and Dwiggins. The text may have been written—possibly by C.F. Whitmarsh—in mid-June before Dwiggins’ birthday. 32. “The School of Illustration puts its pupils through the routine of real work. They learn the profession of illustration by its pactice, just as every profession must be learned.” From Speaking of Results [by Frank Holme] (Chicago: The School of Illustration, 1901), p. .
33. One flaw with this theory is that the two copies of the Epworth League item that survive outside of the 2001 Dwiggins Collection at the Boston Public Library are bound with other Epworth League ephemera, implying that the item was publicly distributed. I want to thank David Faulds of the Bancroft Library, University of California at Berkeley, Gayle Martinson of the Wisconsin Historical Society, and James Scott of Special Collections, Sacramento Public Library for their assistance.